We bring new meaning to the daily grind! 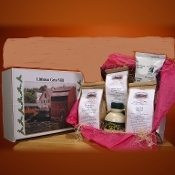 We can give you wholesale prices for multiple products if you make gift baskets for your business or non profits. Contact us for wholesale prices for Maple syrup, honey, and mixes. MIX, WE HAVE A FANTASTIC MIX AVAILABLE. IF you dont want to use your credit card on our website you can place the order and press print and call or email us,Tell us you placed an order and want to pay by check. You can send us a check in the mail. WE WILL CONTINUE BUSINESS THROUGH OUR WEB-SITE. OUR WEBSITE ACCEPTS ALL CREDIT CARDS. 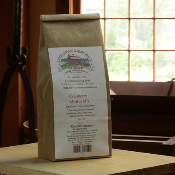 Please let us know you are trying to reach the littleton grist mill. WE LIVE IN LEE NH. AND WE CAN DELIVER TO PEOPLE WHO LIVE OFF *93 ON OUR WAY TO LITTLETON. ALSO ....WITHIN 20 MILES OR SO, OF LEE. 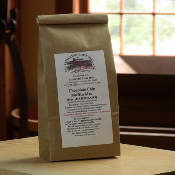 WE ALSO CAN DROP OFF PRODUCTS AT THE LITTLETON DINER FOR YOU TO PICK UP.ALSO IN HOOKSETT AT ROBIES GENERAL STORE. SHOOT US AN EMAIL OR CALL, WE ARE ALWAYS WILLING TO GET THE PRODUCT TO YOU FOR NO COST. ONLINE ORDERS CAN BE PLACED 24/7 PLEASE KNOW PROCESSING CAN BE 7 TO 10 DAYS. MOST ARE PROCESSED WITHIN 1 OR 2 DAYS WE WILL E-MAIL OR CALL YOU IF WE RUN INTO ANY PROBLEMS. If you live in NH, we offer free shipping or delivery when your order totals $40.00 or more. (use coupon code 55566 )in checkout. Littleton's economic community has its roots in the Littleton Grist Mill and saw mill that Solomon Mann opened for business in 1798. As other buildings were added, the mill complex eventually became the village of Littleton and the nucleus of its industry. 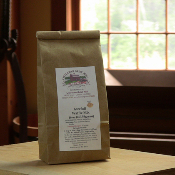 The energy to power the mills was supplied by the Ammonoosuc River with the aid of a dam.Although the dam no longer exists, the original grist mill still stands and is restored to its original appearance. Our products are made in small batches. We print our own labels,put them on the bags by hand. We package and weigh each product by hand one at a time. We are a hands on company. We strive for quality. If you ever have a problem with our freshly ground products, ( Remember they have no preservatives, pesticides or insecticides) please feel free to contact us ,so we can correct any problem. 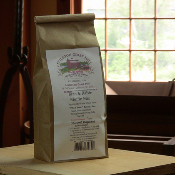 Our flours should be stored, preferably ,in the freezer until ready to use. ALSO MOOSE MUSH AND GRITS. Littleton Diner in Littleton NH serves our Buckwheat and Whole Wheat Pancakes all day. Franconia Inn in Franconia NH serves our Whole Wheat Pancakes. 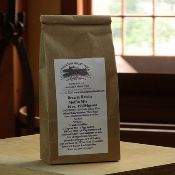 Most of our products are available in 25lb bags for whole sale customers. Please call us. We have most of our products in a new 16 oz size. We can wholesale 16 oz sizes for large gift orders. 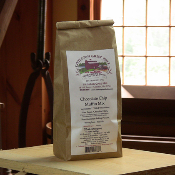 Our 32oz mixes and flour is available there. We are glad to see Amber and Josh Enright running the store. Be sure to stop in for breakfast, or any time you are in their area. Tendercrop at the Red Barn.The old Tuttle Farm. Don't forget to try our Buckwheat and Whole Wheat pancakes served all day at the Littleton Diner. 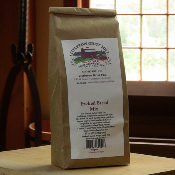 THEY CARRY 1 LB BAGS OF WHOLE WHEAT PANCAKE AND BUCKWHEAT PANCAKE MIXES FOR SALE. Chocolate Chip Muffin Mix 32 oz Cranberry Muffin Mix 16 oz. Cranberry Muffin Mix 32 oz.